Queen panel bed with USB ports, matching dresser with six full-extension drawers and landscape mirror in a warm brown finish. King panel bed with USB ports, matching dresser with six full-extension drawers and landscape mirror in a warm brown finish. Suite includes king bed with plank panels and an architectural 74-inch headboard, accompanied by matching 8-drawer dresser and mirror. Suite includes queen bed with plank panels and an architectural 74-inch headboard, accompanied by matching 8-drawer dresser and mirror. Queen bed, triple dresser and matching mirror create a casual, seaside vibe with louvered insets in an airy eggshell white finish. King bed, triple dresser and matching mirror create a casual, seaside vibe with louvered insets in an airy eggshell white finish. A distressed white finish and louvered panels give this king bed with matching dresser and mirror the appeal of an airy seaside retreat. King suite crafted from pine solids in a dark cherry finish incorporates intricate detailing and classic 18th century motifs. King suite includes sleigh storage bed with built-in USB ports, 6-drawer dresser and landscape mirror in a warm whiskey brown finish. King panel bed with two full-extension storage drawers and USB charging, dresser and matching mirror in a grey peppercorn finish. King sleigh bedroom in peppercorn finish includes bed with storage footboard and USB ports, 6-drawer dresser and landscape mirror. 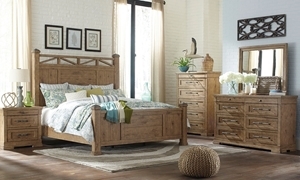 King sleigh bed in a versatile peppercorn finish features two full-extension storage drawers and built-in USB ports.